The K8000 is controlled by software on your computer. Programmers can create their own applications, using libraries and sample code provided by Velleman. This programming is done in the common programming languages like Visual Basic and Pascal. Not everyone is capable to program in these languages, so they can't use the K8000 card. Unless they use a program that has been written by someone else. But most software for the K8000 is very application-specific. This made me decide to write a software tool, allowing people to create their own K8000 applications. The result of this work is: 'Power WinPLC'. WinPLC is a program, where you can construct K8000 applications very quickly, with very few commands. WinPLC offers you a sort of programming (scripting) language, but the language is easy to learn. All available commands are in a list, where they can be picked. The advantages are clearly: you don't have to remember all commands and you don't have to type them, so the construction of a program will be done very quickly. 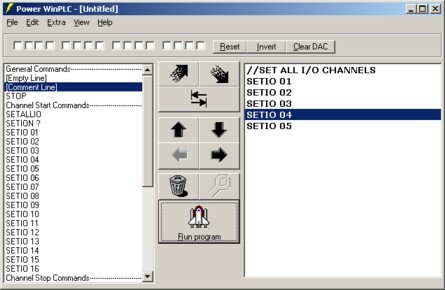 There are only commands like 'SETIO 01' (setting Input/Output channel 1). You don't have to worry about the communication with the K8000 board. You can view some program examples on the website. WinPLC offers a way to control all features of the K8000 card: setting digital inputs/outputs (lights), setting analog outputs (dimmers), reading analog inputs (temperature sensors). Every command is listed in the helpfile, with an explanation and demonstration on the usage. WinPLC is also useful for people with programming experience: you can build testing software for K8000 hardware real fast, and WinPLC offers possibilities speech output or speech recognition. WinPLC can be controlled from other Windows applications. You could write your own windows applications in your favorite programming language, and access the K8000 card through WinPLC. This is perfectly possible. I have made examples on how to control WinPLC from Visual Basic, Word, Excel, ASP Pages, VBS Scripts, client-side webpages and even Java. WinPLC can actually 'talk' to you: it can make your computer say a sentence, in the language of your choice (French, German, Dutch, English ... aren't a problem for WinPLC. However: you need to download and install an extra program from the website to do this (winplc speech addon from the download section). WinPLC can be your finest buddy, since you can use Speech Recognition with WinPLC. So saying 'start light' could actually start the lights in your living room. This speech recognition module must also be downloaded and installed as an extra program.